The Five of Stars (Pentacles) is generally a card about loss (whether it be financial, poor health, bad luck, etc.) but also a reminder that this too shall pass. As cliche as it may sound, what doesn’t kill you makes you stronger! 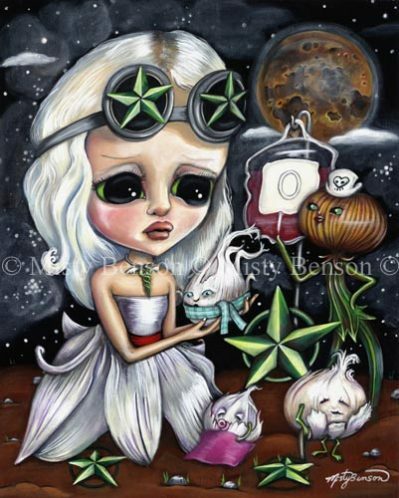 In this scene, the sweet doe-eyed girl is doctoring the young, old, and ailing onions. It’s a bit tongue-in-cheek as onions have their place in history of folk remedies ranging from raw onions being placed around the home to absorb flu viruses/cold germs to the Ancient Greeks rubbing them on sore muscles. After four cards that were generally smooth sailing, it shows that even the strong may have to weather a storm. So don’t see this as a negative card, but rather a reminder of the valuable lesson that growth and strength comes from the difficulties in life. Whether you are a fan of the Morbidly Adorable Tarot, or you just adore this big eye girl, this painting is full of sweetly spooky symbolism!